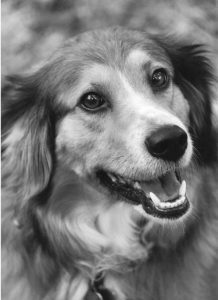 There are certainly as many ways to learn to play bluegrass style banjo as my dog has fleas, bless his heart. After playing and teaching banjo for many years, I came up with an approach that is different from any banjo books that I’ve seen. Let me explain. The most common way to teach a beginner the fundamentals of playing bluegrass banjo is to sit them down and show them the basic rolls. Then the teacher often show the student a tune like “Cripple Creek” or “Bile Em Cabbage Down,” using those rolls. We’ll call this approach the “Roll Method.” Lord knows it has worked perfectly with students who are born with loads of natural talent, or are experienced playing other stringed instruments. But what I have found is that many rank beginners and people with only modest natural ability are left behind using this method. They are befuddled, confused, and frustrated trying to figure out how to integrate the melody into the rolls. To solve this problem, I came up with the ‘Melody Method.’ First, I teach my beginning students a basic G scale, so they can find the notes they’ll need to play most any song in the key of G. Then I show them the simple bare bones melody of a common tune, such as ‘Katy Cline’ or ‘Roll in My Sweet Baby’s Arms’ which both share the same basic melody. After the student can play the tune, I very gradually add simple rolls. First, I show them the simplest roll, the thumb-pinch (a melody note played with the thumb followed by the 1st and 5th strings played together at the same time). Once they can play a number of tunes playing the melody and adding the thumb-pinch I slowly show the student other rolls that they can alternate with the thumb-pinch. The ‘Melody Method’ has been a life saver to thousands of struggling banjo students who have learned to play using my book Bluegrass Banjo for the Complete Ignoramus. 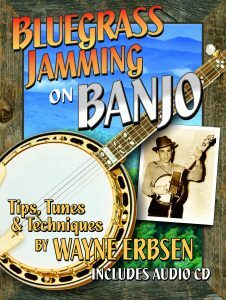 In 2013 I published a new book called Bluegrass Jamming on Banjo which is a follow up to the Ignoramus book. It contains the bare bones melody of over 30 bluegrass songs not included in the Ignoramus. The book also explains many of the tricks of playing by ear, jam etiquette, jamming on songs you don’t know, and improvising. In August of 1926, Ernest V. Stoneman journeyed from his home in Grayson County, Virginia to New York City to be the first to record what he called ‘Katie Kline.’ He based his version on a composition that was originally written in 1853 by L.V.H. Crosby with the title ‘Kitty Clyde.’ The Monroe Brothers recorded it on February 15, 1937 in Charlotte, North Carolina and spelled it ‘Katy Cline.’ Their lightning-fast version probably did the most to help popularize the song among the generation that would witness the birth of bluegrass music. 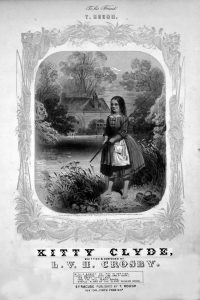 As you play through the melody of ‘Katy Cline,’ you might notice that it sounds vaguely familiar. If that’s the case, it’s probably because its melody and chords were apparently used in the song “Roll in My Sweet Baby’s Arms,” which was first recorded in 1931 by Buster Carter and Preston Young. ICE COLD LICKS: Pick out the plain ole melody with your thumb. On line 4, use your ring or pinky on the 4th string and your index finger on the 3rd string, Add a smidgen of drones (1st string) , mix in the thumb-pinch and alternating-thumb roll (3-1-5-1 or 4-1-5-1). Stir vigorously. 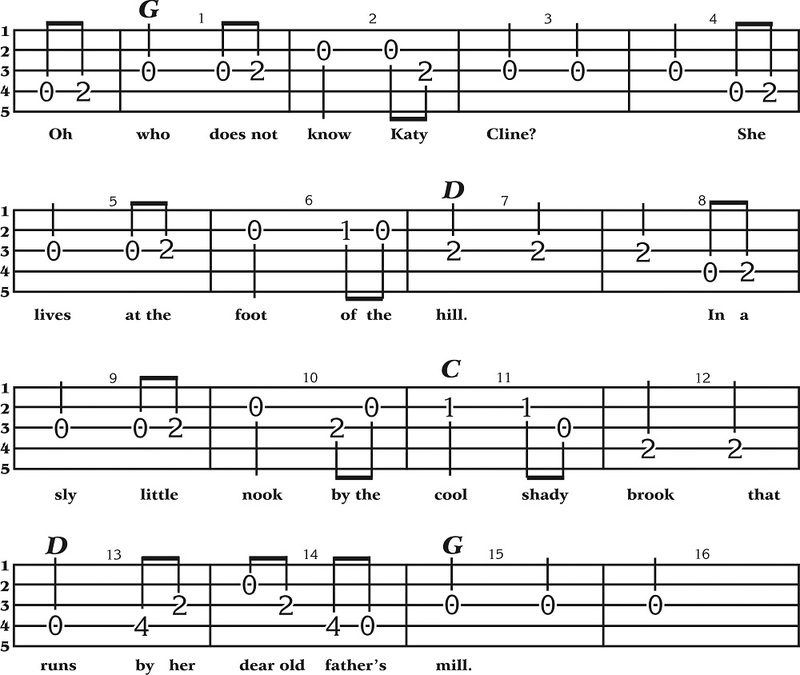 NOTE: The chord progression of “Katy Cline” is what you would expect in a traditional bluegrass song except that it goes directly from a C to a D in lines 3-4. This is fairly rare and it supports my theory that “Roll in My Sweet Baby’s Arms” (1931) was closely patterned after the much older “Katy Cline” (1853). COOL LICKS: “Katy Cline” is a good song to use the reverse roll (3-2-1-5-1-2-3-1). You can use it in measures 1, 5, 9 and 15 by fretting the 3rd string at the 2nd fret when you play the last 3. Remember that the final 1 of the reverse roll is optional. WARM LICKS: If you’re ready to trot out your forward roll (3-1-5-3-1-5-3-1) you can use it in measures 3 and 7. You’ll want to start it with your index finger because you just used your thumb, and you’ll want to avoid using the same finger twice in a row. HOT LICKS:: In measure 11 you can use the forward roll. Since the melody changes strings, your roll would be 2-1-5-2-1-5-3-1. SMOKING HOT LICKS (above): Now let’s put on our big boy (or girl) pants to play one of Earl’s greatest licks, a modified reverse roll with a pull-off (p) and a slide (s). It will replace measures 13-14. The Pull-Off: Fret the 3rd string at the 2nd fret AND the 3rd fret. With your middle finger pluck the string at the 3rd fret while holding the 2nd fret firm. For more information about Wayne Erbsen’s instruction books for bluegrass and clawhammer banjo, mandolin, fiddle, guitar and ukulele, visit www.nativeground.com.